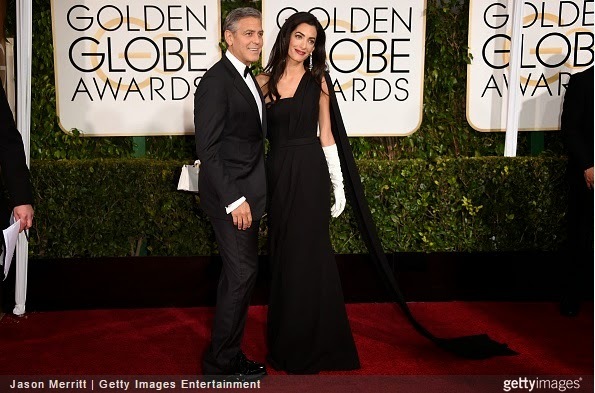 Amal Clooney was deemed most fascinating woman of 2014 after her marriage to confirmed hollywood bachelor George Clooney in the celebrity wedding of the year. Now the couple are bringing that razzmatazz to the Golden Globes red carpet. Update - George Cloonet later revealed that he was wearing his Giorgio Armani wedding tuxedo. The said this while on stage to receive his 2015 Cecil B. DeMille Award at the Sunday Golden Globes ceremony. He also showed his love and appreciation to his wife Amal Clooney.